Arcadia group are a global force in fashion; both dynamic and diverse. They offer up-to-the-minute affordable fashion in numerous stores throughout Ireland. Arcadia attracts fashion-conscious shoppers with its stylish and atmospheric stores. 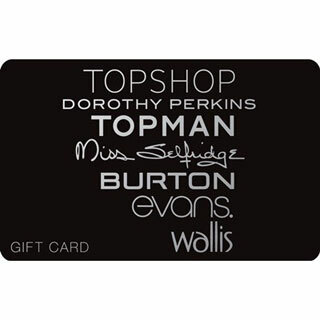 With Topshop/Topman, Dorothy Perkins, Miss Selfridge, Burton, Evans, and Wallis included in their branding and numerous stores throughout Ireland, this card provides something for everyone! How it Works: Use this gift voucher on AllGifts.ie to order gift cards for use in any of the listed Arcadia Stores in the Republic of Ireland. Or you can swap this voucher for any other gift or voucher listed on AllGifts.ie. Arcadia gift cards are posted out free of charge once ordered. Please note that the cards are NOT valid in concessions in third party stores (eg. Topshop in Debenhams store). 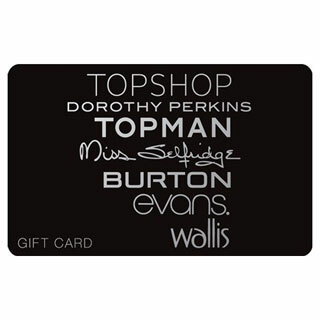 Arcadia gift cards are available in denominations of €10. Minimum gift card value is €10. Arcadia Gift Cards are posted out free of charge, normally within 5 working days.